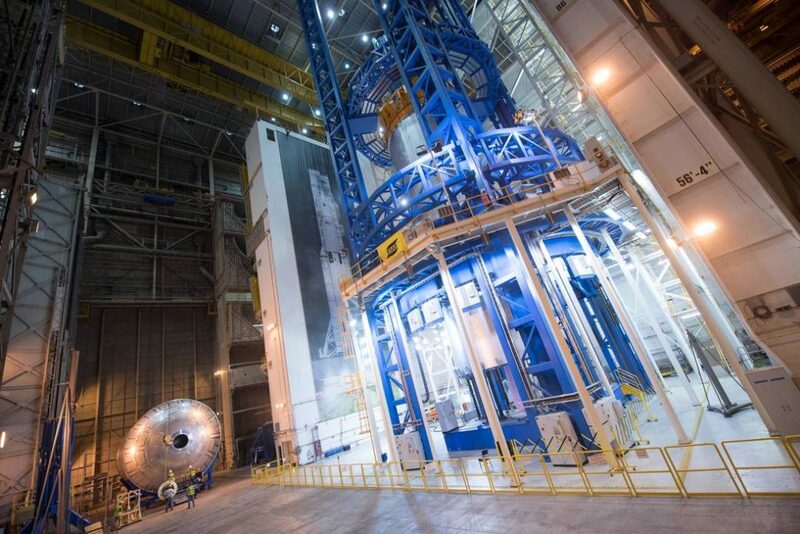 June 23, 2016 – A qualification article for the liquid hydrogen tank on NASA’s new rocket, the Space Launch System, undergoes welding in the Vertical Assembly Center at Michoud Assembly Facility in New Orleans. At the same time, a crew completes installation and checkout procedures for the liquid oxygen tank weld confidence article, left. The liquid hydrogen and liquid oxygen tanks make up the SLS core stage. Towering more than 200 feet tall with a diameter of 27.6 feet, the core stage will store cryogenic liquid hydrogen and liquid oxygen that will feed the vehicle’s four RS-25 engines. Confidence hardware verifies weld procedures are working as planned and tooling-to-hardware interfaces are correct. The confidence article also will be used in developing the application process for the thermal protection system, which is the insulation foam that gives the tank its orange color. The liquid hydrogen qualification article closely replicates flight hardware and processing procedures. Once completed, it will be shipped on the Pegasus barge to NASA’s Marshall Space Flight Center in Huntsville, Alabama, for structural loads testing on one of two new test stands currently under construction for the tanks. All welding for the SLS core stage for the initial Block I configuration of the rocket — including confidence, qualification and flight hardware — will be completed this summer in preparation for its first test flight with NASA’s Orion spacecraft in late 2018. That flight, called Exploration Mission 1, is critical to paving the way for future flights with astronauts to deep space, including on a journey to Mars.